Costco sells this prime ribeye cap coiled up. It is super delicious. In order to keep it from turning into charred outside and raw inside on the grill, John used the sous vide method. He set the steak jacuzzi on 122F and we let it cook for 1 1/2 hours. Then he slapped it on a hot grill for a couple of minutes to brown the outside. It was perfectly cooked all the way through! I made smashed red potatoes with olive oil and steamed some broccoli. We also opened a nice bottle of Cabernet Sauvignon to go with it. 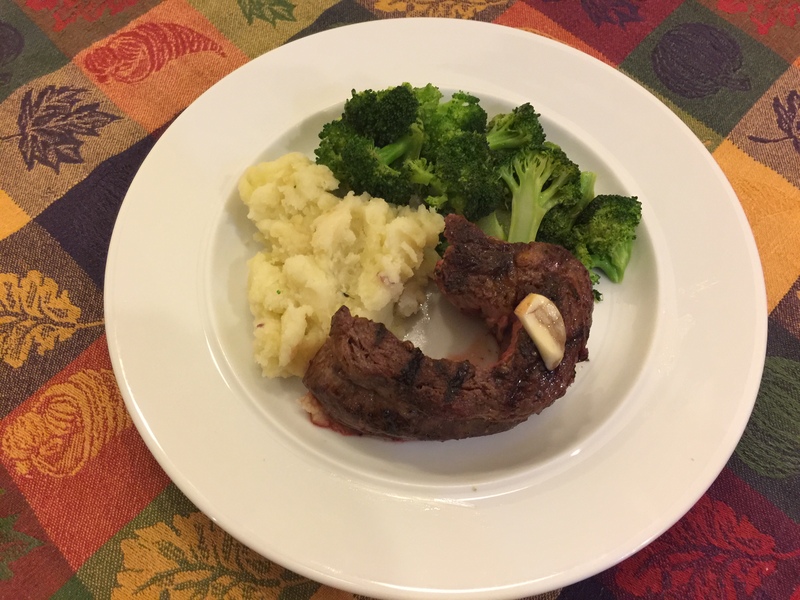 This entry was posted in Beef, Vegetables and tagged broccoli, potatoes, ribeye steak. Bookmark the permalink.